KIKI Health`s CBD Aqua+ is a new, innovative and drinkable alternative to CBD oil. As it is soluable in water, the body promptly and completely absorbs it. 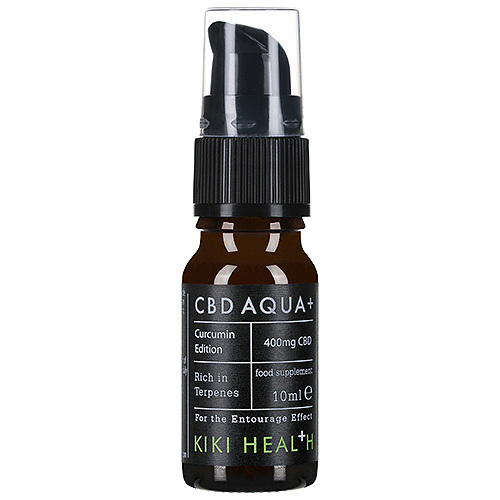 KIKI`s CBD Aqua+ contains all terpenes that are the pungent oils found in the primal hemp, which in turn means that the cannabinoids that reach the bloodstream are degraded much more slowly, ensuring a more positive effect. CBD Aqua+ also contains a revolutionary blend of plant-based active ingredients that have been carefully chosen in regards to how each ingredient works together, and in turn enhance their effectiveness. Per pump - 0.2ml: 8mg water-soluable CBD, 2mg water-soluable curcumin. Bottle size: 400mg water-soluable CBD and 100mg water-soluable curcumin. Approx 50 pumps per bottle. Spring water, vegetable glycerin, triglycerides, CBD full plant extract, curcuma longa (95% curcumine), sodium bicarbonate, myrcene, B-Caryophyllene, limonene, pinene, linalool. Put 1 dosage (0.2ml per pump) in a cup of water, drink or spray directly into mouth. Use 1-2 pumps a day unless otherwise advised. Do not exceed 20 pumps per day/in a 24 hour period. Below are reviews of KIKI Health CBD Aqua+ Curcumin Edition - 10ml by bodykind customers. If you have tried this product we'd love to hear what you think so please leave a review.